This morning I warmed up with 1/2 mile walk and then cooled down with the same. After the warm up, I ran 2 miles, walked mile 3 and ran mile 4. Even with the walk factored in, my time was still 52:54. My first 2 miles I average 11:30. Overall average pace was 12:30. 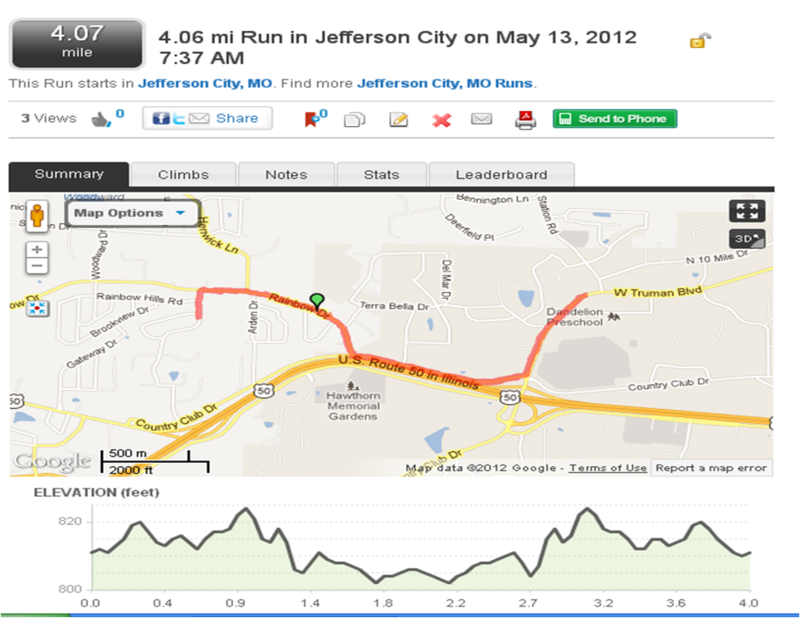 Below is the map of my run still with some hills, inclines, etc. Still improving and will continue with the 4 miles each day this week. By weeks end, hoping to run all 4 miles at 11:30 pace. By the way…I’m still going strong with diet. I’ve lost 7 pounds and 98.9% (according to the body comp test) is from fat. All of this effort today burned 487 calories. 🙂 Kicking that excess weight to the curb. A shout out to all the Mom’s out there – Happy Mothers Day to you. I had too much fun Friday night that Saturday was a bit slower paced. So today I have to kick it into high gear to get everything done. Tonight is the lead into next weeks finale of the Celebrity Apprentice. Can’t wait!! By the way if you have not seen my favorite video of Trump and “Timmy” a little boy from Make a Wish Foundation that dreamed of meeting Donald Trump…here it is – Love this! This entry was posted in Diet, Fitness, running, Tips, Video. Tagged Apprentice, Celebrity Apprentice, Donald Trump, fitness, Make-A-Wish Foundation, Mother's Day, Road running, Running. Next Post Next post: Feeling Stronger Every Day and Visualizing Success!